WOOSTER, OH – Big news in the Geology Department: our new X-ray lab is being installed this week! Early last year, the Geology Department was awarded funding from the National Science Foundation to acquire X-ray instruments to enhance our robust undergraduate research program. Installation has been long awaited, highly anticipated, and wouldn’t have happened without the hard work of many people on campus. We have Ron, Patrice, Tracy, and the electricians and plumbers to thank for making it happen. The installation will probably take all week, but so far (knock on wood), things are going smoothly. It's as if the space was designed especially for the X-ray fluorescence spectrometer (XRF). 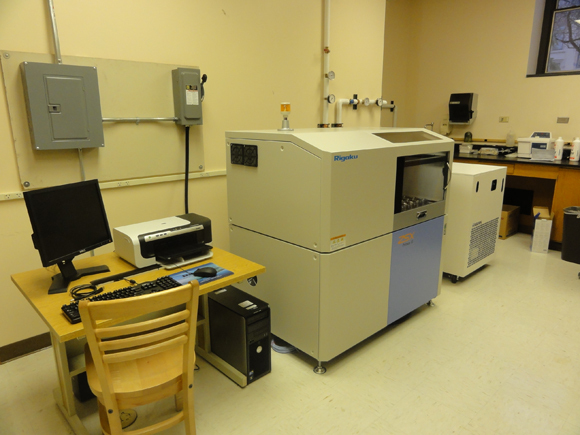 The XRF will allow us to measure the compositions of Earth materials right here on campus. No longer will we need to send our samples (or our students) to other labs for major element analyses! Not pictured (and still wrapped in plastic) is the benchtop X-ray diffractometer (XRD), which will enable us to analyze the mineralogy of samples. We hope our lab serves as a regional center for X-ray analyses and encourages collaborations with physicists, chemists, archeologists, and geologists. Stay tuned for updates! WOW! This is an excellent addition to the lab equipment! Todd, Adam and I would of put this to great use with our samples from Iceland. AWESOME! 🙂 It looks so great. I’m an amateur geologist in my spare time and I would love one of these.Lucky students is all I can say!